Wednesday was a lazy day on the ship. To make up some lost time and to hit as many dredge and HabCam stations as possible, there were a few long “steams” during my shift today. The ship can’t go full speed when pulling the dredge or the HabCam, so in order to go full speed, the ship “steams” with no scientific tools in the water until it reaches its next destination. We had about five hours of “steam” time today and the rest of the day was spent with HabCam, so I didn’t smell like sea scallops at the end of my shift, but I still prefer the more active days. I used some of my spare time to go visit the Bridge. Remember, this is where the Captain, engineer, and mates keep the ship moving on the right course and keep everything operating smoothly. Since it was rainy outside, the big windows in the Bridge were a nice substitute to the deck where I usually like to spend my free time. Mary, one of the mates, was on duty. She has been working on boats for more than 20 years and has been on the Hugh R. Sharp for four years. She was kind enough to give me an overview of the function of each of the seemingly limitless computers and buttons that she and the engineer use to do their jobs. I was surprised by how computerized everything is, from steering, to navigation, to monitoring the water and fuel of the ship. There are duplicates of many of the computer systems, in case something doesn’t work and non-technical ways to navigate the ship too, like paper copies of nautical charts. 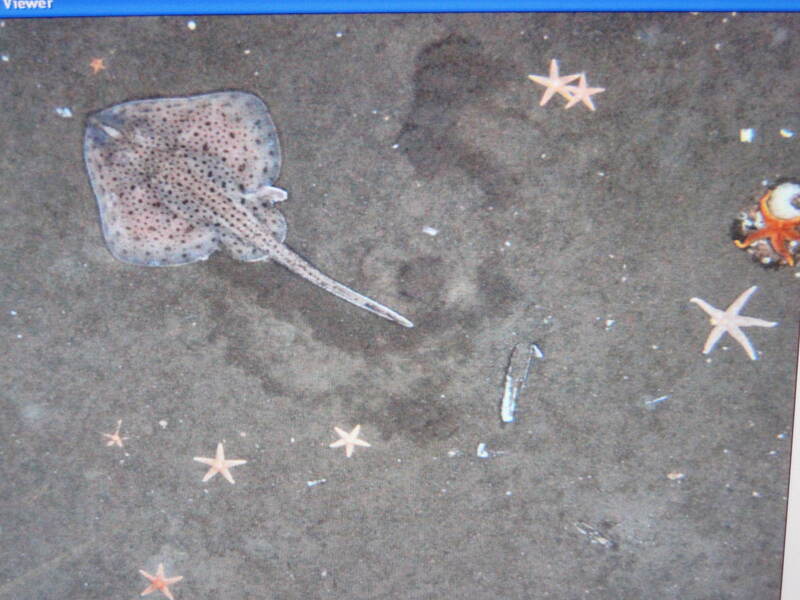 While flying the HabCam Wednesday, I was struck by the amazing camouflage of some of the creatures that live on the ocean floor, like monkfish, flounder, and skates. If you don’t know what you are looking for or if you blink at the wrong moment, they are very easy to miss. It’s neat to see these adaptations in action! I’m glad that I got to experience this science tool in its early stages and appreciate the relationships that the HabCam allows you to see between different animals and how the animals live on the ocean floor that you can’t tell from a dredge haul. Since Wednesday was lazy, Thursday was insanely busy! We made it through nine dredge stations during the day shift and one haul was so large that we had almost 6,000 scallops (not to mention all the rocks, fish, sea stars, crabs, etc.). Everyone worked together to get this giant haul sorted and processed. Mary even came down from the Bridge to help! 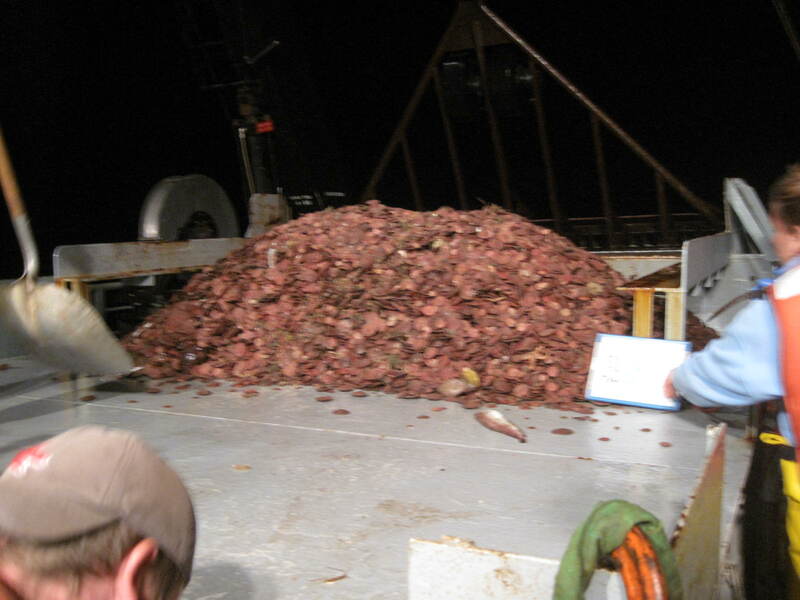 When a haul is this large, we don’t measure and weigh every scallop. Instead, we count the total number of baskets (about the size of a laundry basket) of sea scallops and randomly select two baskets to measure and weigh. The number and average length of the overall scallop haul is calculated based on this subsample. There’s lots of math involved in this process! We dredged in an area with lots of big rocks and boulders today, so the crew added rock chains to the dredge to help keep the giant boulders out of the dredge. It doesn’t come close to keeping out all the rocks, though! They also added what looks like a metal slide that goes from the side of the sorting table to the edge of the deck to help get the giant rocks off of the table and back into the ocean. I’m constantly amazed at how the scientists and crew seem to anticipate and have a plan for every possible obstacle we might run up against. I expect that is the result of lots of years of experience and very careful planning. The scallop with pink is female. The other is male. I mentioned in a previous post that we weigh about 5 scallops from each tow individually and also weigh the meat and the gonad (reproductive organ) of these five scallops individually. 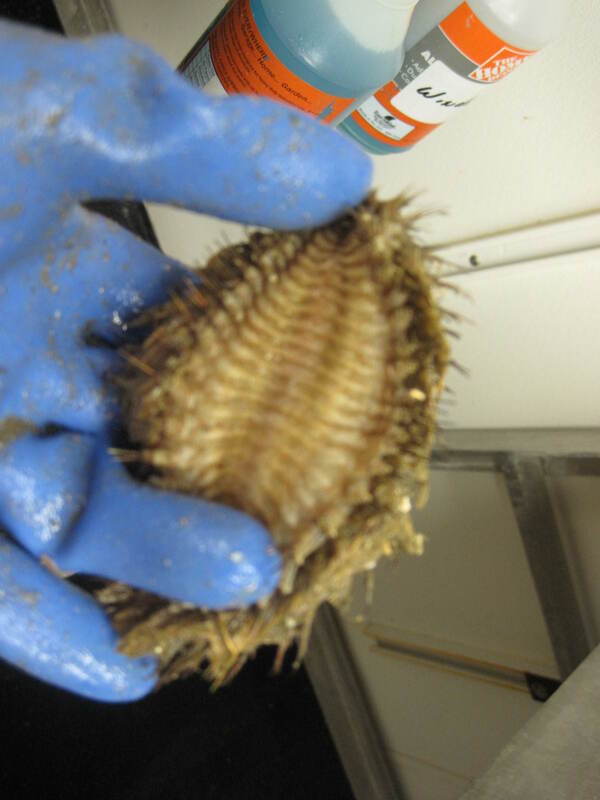 As soon as you cut a scallop open, you can tell if it is a male or female by the color of the gonad. Males are white and females are red or pink, as you can see in this picture. Another interesting tidbit about sea scallops is that they have lots of simple eyes that allow them to see shadows and light. You can see a fascinating close-up of sea scallop eyes by clicking here and can learn more about the anatomy of a sea scallop by clicking here. Since this is a sea scallop survey, I’ve spent quite a bit of time with sea scallops, but I’m still not very skilled at cutting sea scallops to remove the meat quickly. One of the ladies on my watch can shuck about twenty for every one I shuck! She’s offered me lots of pointers, but I’m not going to win a scallop cutting contest any time soon. When we finish sorting and processing each haul, we usually remove the meat from the scallops, wash it, bag it, and put it in a freezer. It can seem like the work is never done when there’s a big haul! The 4th of July at sea was business as usual; no firework or backyard cookouts for me this year. However, we did make a cake and sing happy birthday for the youngest member of the science group’s 20th birthday. Since we didn’t do any dredging or anything active on Wednesday, I felt like I needed to run laps around the ship after my shift ended. I settled on trying the stationary bike instead. Riding a stationary bike on a ship that is rocking and swaying means that the bike isn’t really all that stationary! I think I got a nice abdominal workout from trying to keep myself balanced. It felt good to move, though. On Thursday, we had a fire drill. The Captain was nice enough to schedule it at 12:15 pm, just as one shift was ending and one was beginning, so that people would not be in bed or in the shower when the drill began. 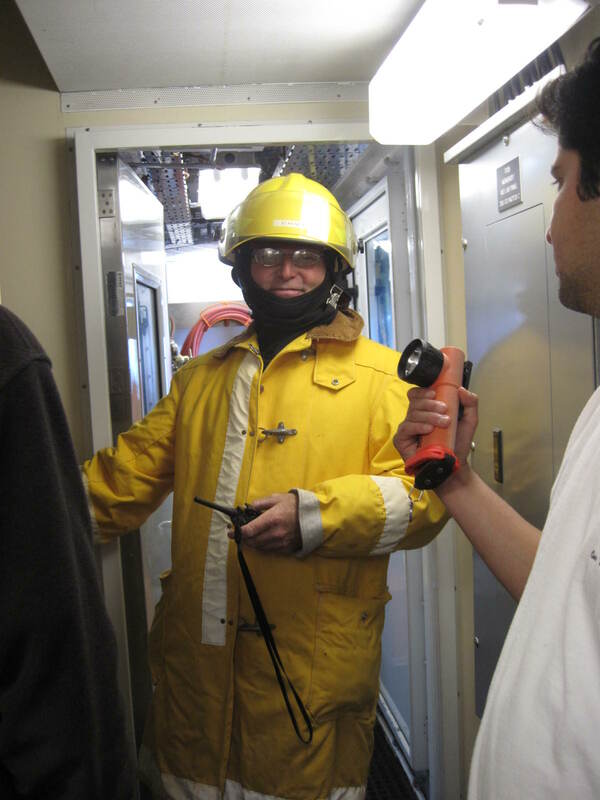 During the fire drill, an alarm sounded and the Captain came on the intercom to tell us that it was a fire drill and that all scientists should muster (gather) in their designated spot. All of the scientists met in the dry lab with a life jacket where the chief scientist counted us and reported back to the Captain that we were all accounted for. We waited while the crew finished its part of the drill, then went back to work (or bed, for the night shift). I felt kind of like a student in a fire drill at school! As I look around the ship, I find it interesting how things are designed for life at sea, like the hooks at the top of every door. If you want a door to stay open, you need to hook it, otherwise the rocking of the door will slam it closed. The table in the galley has about a half inch lip around the edge of it and the drawers of the pantry need to be opened in a special way, because they don’t just slide open. Thanks to these details, you don’t really hear things sliding and crashing around like you might imagine you would when the ship is rocking. I’m grateful that I have been able to participate in the NOAA Teacher at Sea Program as a part of the science crew. I have worked hard, learned a ton, and can’t wait to share my learning and experiences with my students! However, I miss my family, so I’m glad that we’re headed back toward land soon! The HabCam-ing and dredging continue here in the North Atlantic in calm seas and clear skies! I learned a new part of the data collection process with the dredge. Each time the dredge goes out, a sensor that tracks the pitch and roll (side to side and up and down movement) of the dredge on the ocean floor needs to be installed on the dredge. 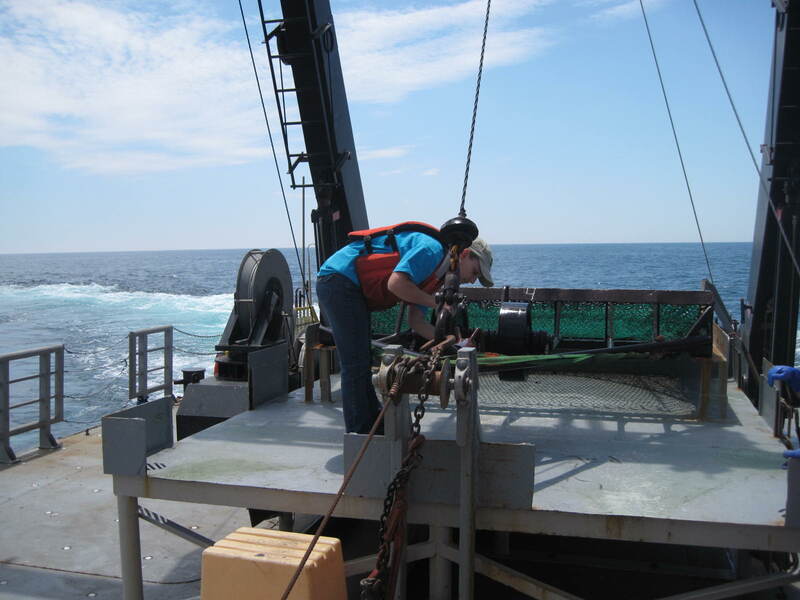 When the trawl is complete, the sensor is removed and the data is uploaded to the computer. It is automatically plotted on a line graph that visually tells the story of the dredge’s movement on the ocean floor. This data is eventually combined with all the other data gathered at each dredge station. Installing and removing the sensor has been my job for the last couple of shifts. To do this, I have to climb up on the sorting table when the dredge is first brought to the surface, remove a metal pin and plastic holder that keeps the sensor in place, remove the old sensor and add a new sensor, then reinstall the holder and pin. This all happens before they dump the dredge. On a funny note, on my way to the sorting table to add the sensor to the dredge earlier today, I managed to trip on a hose that was on deck and turn it on, watering myself and the lab technician that was on the deck with me and entertaining everyone else watching, I’m sure! Luckily, we were all wearing our foul weather gear, so no one was soaked!! It’s interesting to experience all the different pieces that make a successful dredge tow. Before coming to sea, I guess I just assumed that you lowered a big net to the ocean floor and hoped to catch something. I had no concept of how methodical and detailed each deployment of the dredge really is, from the locations, to the timing, to the number of people involved, to the detailed data collection. The process is still being refined, even on this third leg of the sea scallop survey. One of the scientists on my watch is an engineer who helped design and build the latest version of HabCam. When a part that holds the sensor in the dredge was not working correctly, he was asked to use his engineering skills to create a better way to hold the sensor, so he made the needed modifications right on the ship. While sorting the haul from dredging stations, I sometimes run across ocean critters that I’ve never seen before. I usually set these to the side to snap a picture after we finish sorting and to ask a scientist, usually Karen or Sean, to identify it for me. It turns out that the strange hairy, oval-shaped creature I keep running across is a type of worm called a sea mouse. In my pictures it looks like a grassy ball of mud, but it’s much more interesting in person, I promise! I consulted a field guide in the dry lab to learn a little more about it. Its scientific name is Aphrodita hastate and it is usually about 6 inches by 3 inches and can be green, gold, or brown. There are 15 gills hidden under the bristly fur. They like muddy areas and often live in the very deep parts of the ocean, so they are only seen when brought up with a dredge or after being tossed ashore in a storm. I haven’t seen any of them in the HabCam images, so I’m wondering if they tend to burrow in the mud, if their camouflage skills are really impressive, or if we just haven’t flown over any. The HabCam moves so quickly (remember, it takes 6 pictures per second) that it’s impossible to see everything in enough time to figure out what it is. 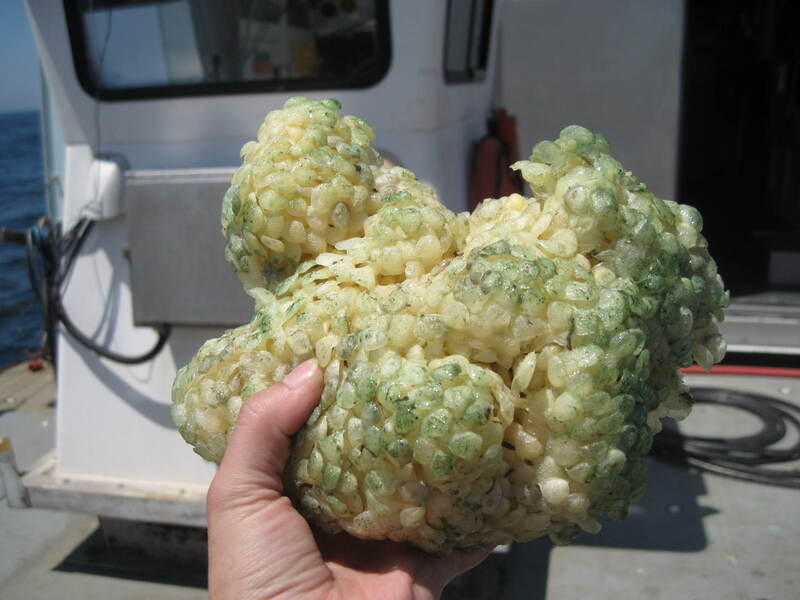 Another item that keeps coming up in the dredge looks like a clump of pasta shells and cheese and it crumbles easily. My initial guess was that it is some type of sponge, but I was wrong. It turns out these are moon snail egg cases. Once I’m back ashore, I think I’ll have to find out more about these. 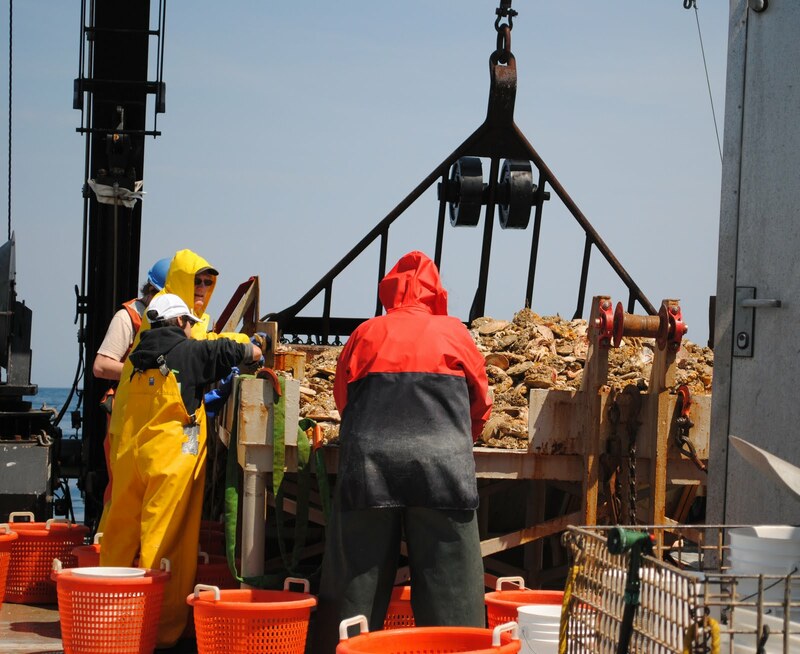 We’ve seen lots of sea stars, scallops, sand dollars, crabs, clams, hermit crabs, flounder, several species of fish called hake, and skates (relative of the stingray) in the dredge hauls. We’ve also seen most of these on the ocean floor with the HabCam. One of the scientists found a whale vertebrae (part of the backbone) while sorting. It’s at least a foot and a half wide and 8 inches high! Can you imagine the size of the whale when it was alive? Each haul usually has a monkfish or two in it. I’ve heard that these fish are pretty tasty, but they sure look mean! I was warned early on to keep my hands away from their mouths unless I want to get bitten! Today is supposed to be a day of mainly flying the HabCam, so I’m hoping to be able to interview a few people on the ship about their jobs for use back at school when I’m not flying the HabCam or co-piloting. I ate my first real meal in the galley tonight and it was pretty tasty! The steward, Paul, has worked on this ship for eight years and seems to have cooking a sea down to a science. He has to work and sleep some unusual hours to keep everyone aboard well-fed, but he does it with a smile on his face. Between the meals, snacks, and limited space to exercise, I imagine that keeping fit while at sea for long periods of time can be a challenge. There is a stationary bike next to the washer and dryer, but other than that you have to be creative with getting your exercise. I saw one crew member on the deck this morning with a yoga mat doing crunches and using a storage container to do tricep dips. He said that it’s a challenge, but that you can find ways to keep in shape at sea if it’s a priority for you. I actually slept better the first few days at sea when I was seasick than I do now that I’m feeling better, thanks to the anti-nausea medication, I expect. I’ve found that earplugs are essential for catching sleep aboard the ship when I’m not medicated! There is one washer and dryer aboard the ship and I’ve had a bit of trouble finding a time when it’s not in use, so I decided to do my laundry at 5 am a day or so ago when I was having trouble sleeping. I figured I may as well use insomnia to my advantage and it was so nice to use a towel that is finally completely dry for the first time in a week! There are 22 people aboard this ship; 12 scientists and 10 crew members. Four of the scientists and two of the crew are women. Because of watch schedules, most of the time I see only two other women while I’m awake. All that to say, the ship is a pretty male-dominated arena, with lots of ESPN, toilet seats left up, and guy humor. I feel very welcome aboard the ship, but I find that I spend most of my down time doing my own thing, like working on this blog or just enjoying the view, since I’m not much of a movie or sports watcher. With fabulous views of the Atlantic Ocean and beautiful weather, this doesn’t bother me a bit! In fact, I find that I see the most animals swimming in the ocean during these down times. Today it was a huge group of jellyfish swimming next to the ship! I’m still enjoying my time at sea and am looking forward to learning even more in my last few days. My last shifts have been a mix of HabCam work and dredging. 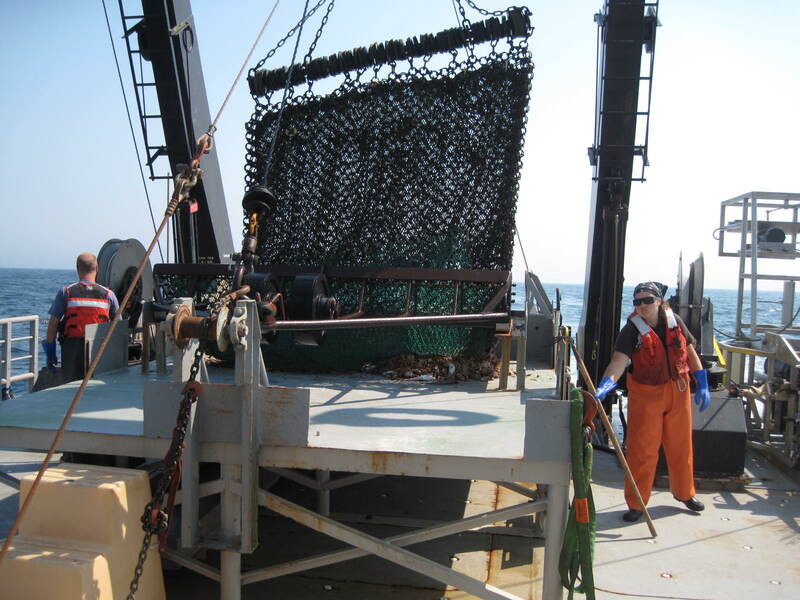 Remember, dredging is when we drag a heavy-duty net along the ocean floor for fifteen minutes, then bring it up and record what ocean critters we catch. Dredging involves a lot more physical work and is much dirtier than flying the HabCam, so time goes much faster when we are dredging and it’s exciting to see what we will catch. However, it is also kind of sad to see all the animals we bring up in the dredge, because most of them are dead or will soon be dead. You can watch a video about sea scallop dredging here and here. 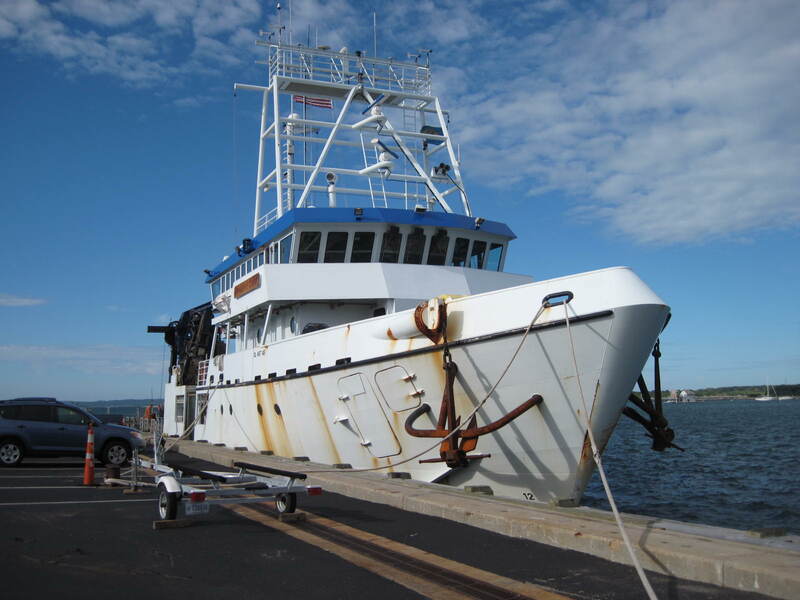 There are three two-week legs to this sea scallop survey. I am on the last leg. Before the first leg began, a computer program, with the assistance of a few people, decided which spots in the sea scallop habitat we should dredge and fly the HabCam. These points were all plotted on a computerized map and the chief scientist connects the dots and decides the best route for the ship to take to make it to all the designated stations in the available time. 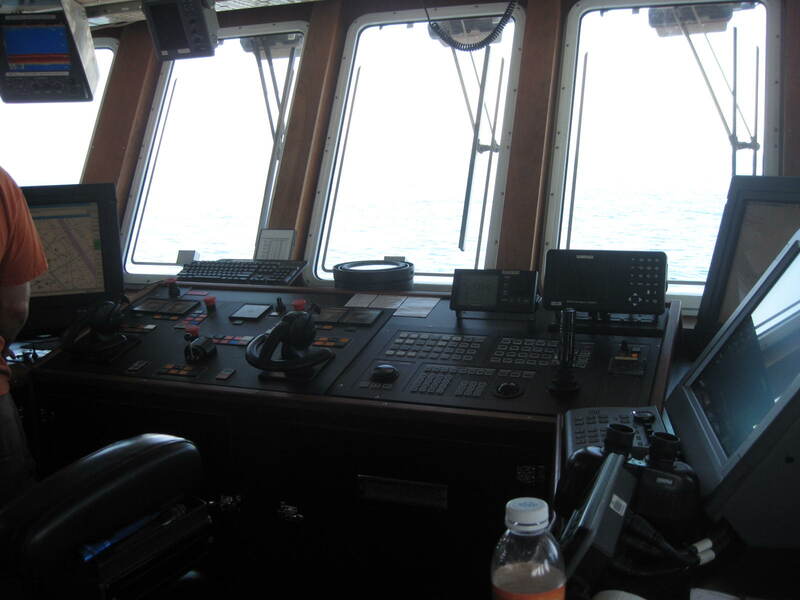 About 10 minutes before we reach a dredge station, the Captain radios the lab from the Bridge (fancy name for the place at the top of the ship where the Captain and his crew work their magic) to let us know we are approaching our station. At this point, I get on a computer in the dry lab to start a program that keeps track of our dredge position, length of tow, etc. I enter data about the weather and check the depth of our dredge station. When the engineer and Captain are ready, they radio the lab and ask for our depth and how much wire they need to send out to lower the dredge to the ocean floor. I get the wire length from a chart hanging in the dry lab that is based on the depth of the ocean at the dredge site and use the radio to tell the engineer, who lets out that amount of wire until the dredge is on the ocean floor. When the dredge hits the ocean floor, I use the computer program to start timing for 15 minutes and notify them when it is time to bring the dredge back up. The lab technicians and engineer raise and dump the dredge on a giant metal table, then secure it for the scientists to come in and begin sorting the haul. 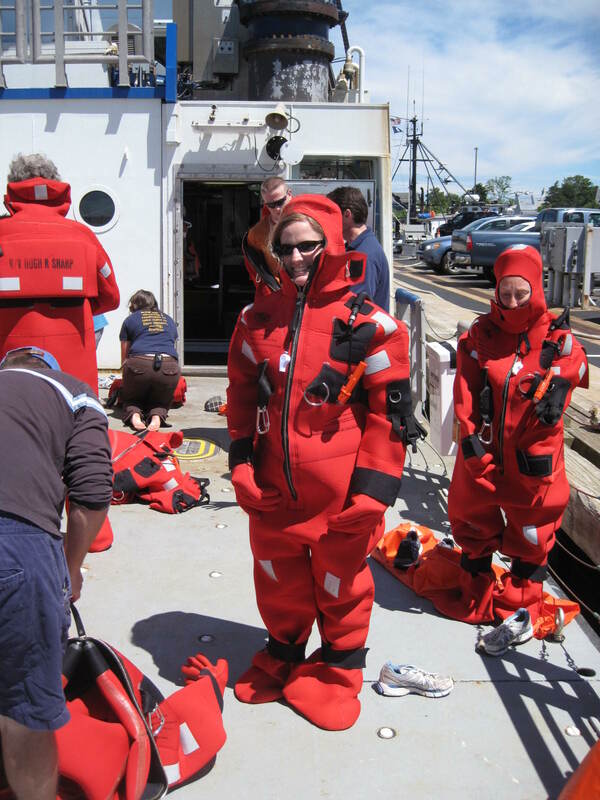 Meanwhile, the scientists get dressed in foul weather gear to prepare for the messy job ahead. That means I’m wearing yellow rubber overalls, black steel-toed rubber boots, blue rubber gloves, and a lovely orange lifejacket for each dredge. Sometimes I add a yellow rubber jacket to the mix, too. Science is not a beauty contest and I’m grateful for the protection! Each scientist grabs two orange baskets, one large white bucket, and one small white bucket and heads to the table. The lab technicians shovel the catch toward each scientist as we sort. Scallops go in one orange basket, fish go in the white bucket, crabs go in the small white bucket (sometimes), and everything else goes into the other orange basket. This is considered “trash” and is thrown back overboard, but the watch chief keeps track of how many baskets of “trash” are thrown overboard during each haul and enters it into a computer database along with other data. 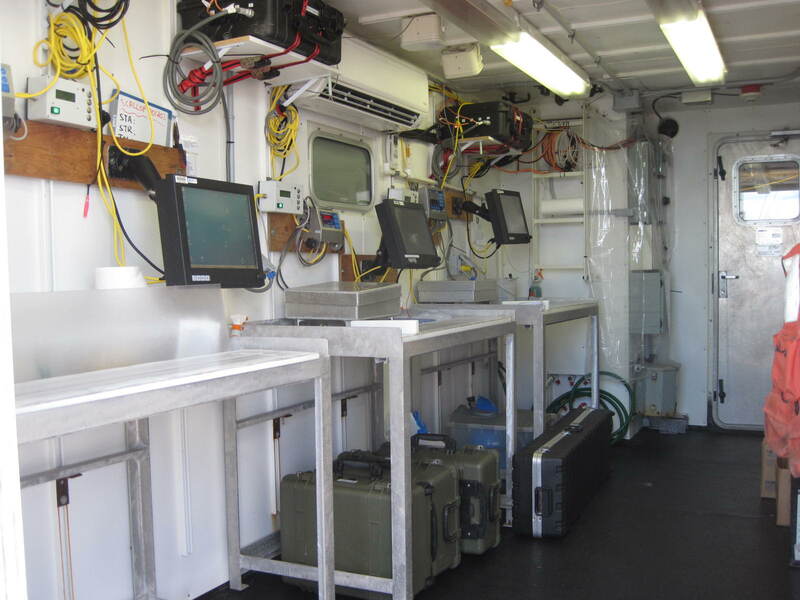 After sorting the haul, much of the data collection takes place in lab called a “van”. 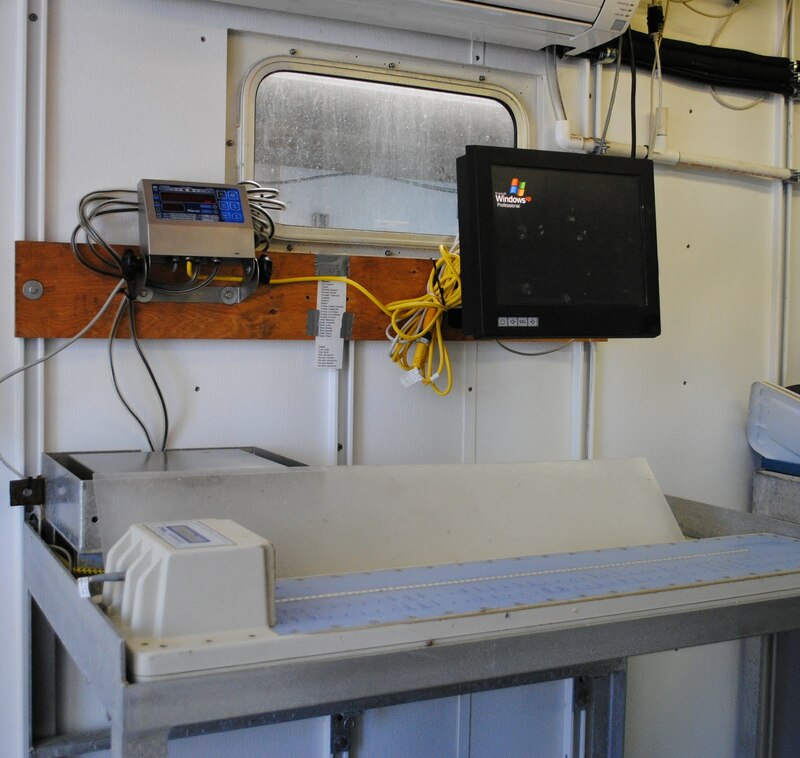 The fish are sorted by species, counted, weighed, sometimes measured, and entered into a special computer system that tracks data from the hauls. Sometimes we also collect and count crabs and sea stars. The baskets of sea scallops are counted and weighed, and then individual scallops are measured on a special magnetic measuring board. You lay the scallop on the measuring board, touch the magnet to the board at the end of the scallop, and the length is automatically entered into the database. Some hauls have lots of sea scallops and some don’t have very many. We had a couple hauls that were almost completely sand dollars and one that was almost completely sea stars. I learned that sea stars can be quite slimy when they are stressed. I had no idea! 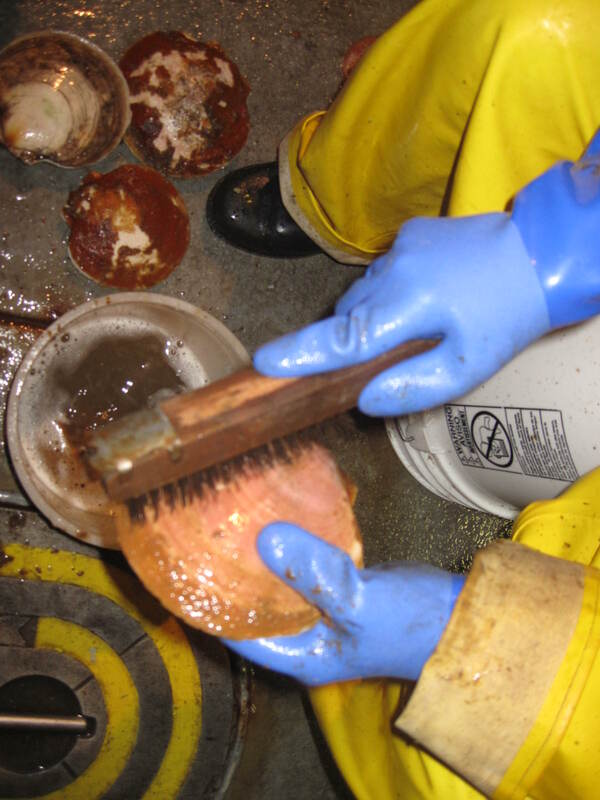 Sometimes my watch chief, Sean, will select a subsample of five sea scallops for us to scrub clean with a wire brush. 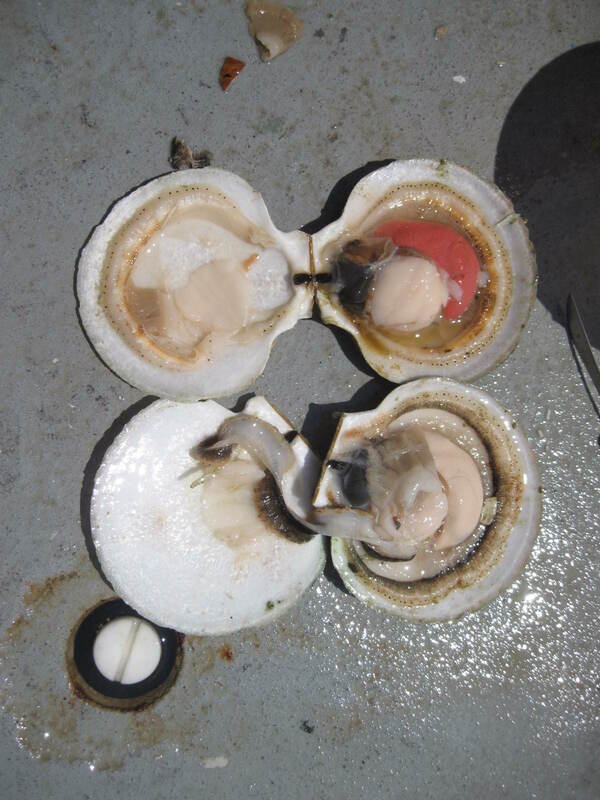 Next, we weigh and measure all five sea scallops before cutting them open to determine the gender. We remove the gonad (the reproductive organ) and weigh it, then do the same with the “meat” (the muscle that allows the scallop to open and close its shell and the part people like to eat). All of this information is recorded and each scallop is given a number. We write the number on each shell half and bag and tag the shells. The shells and data will be given to a scientist on shore that has requested them for additional research. The scallop shells can be aged by counting the rings, just like counting the rings on a tree. Scrubbing scallops is dirty work! Meanwhile, other people are hosing off the deck, table, buckets, and baskets used. The dredge ends by shucking the scallops and saving the meat for meals later. 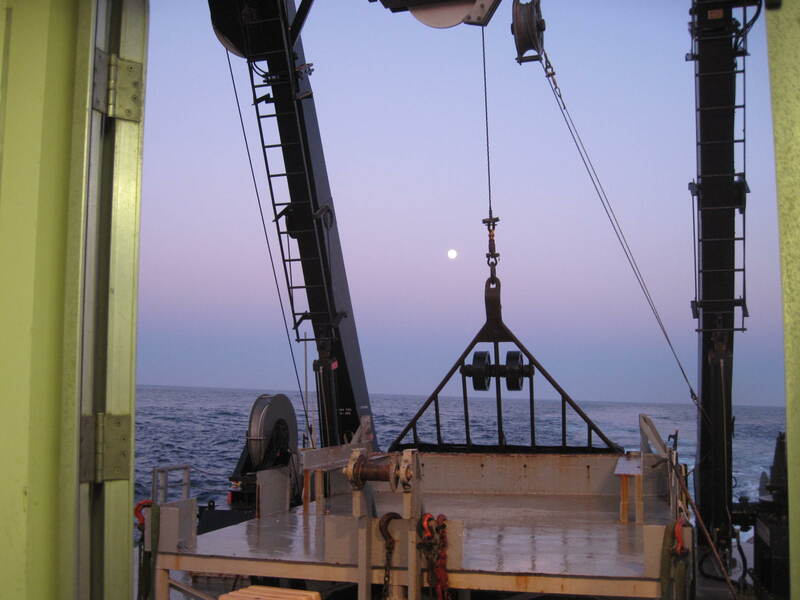 A successful dredge requires cooperation and communication between scientists, lab technicians, the Captain, and the crew. It requires careful attention to detail to make sure the data collected is accurate. It also requires strategic planning before the voyage even begins. It’s an exciting process to be a part of and it is interesting to think about the different types of information that can be collected about the ocean from the HabCam versus the dredge. Living on a ship is kind of like living in a college dorm again: shared room with bunkbeds, communal shower and bathroom down the hall, and meals prepared for you. I can’t speak to the food prepared by the steward (cook) Paul, as I haven’t been able to eat much of it yet (I’m finally starting to get a handle on the seasickness, but I’m not ready for tuna steaks and lima beans just yet), but I do appreciate that the galley (mess hall) is open all the time for people to rummage through the cabinets for crackers, cereal, and other snacks. There’s even an entire freezer full of ice cream sandwiches, bars, etc. If my husband had known about the ice cream, he probably would have packed himself in my duffel bag for this adventure at sea! Taking a shower at sea is really not much different than taking a shower at the gym or in a college dorm… in the middle of a small earthquake. Actually, it’s really not too bad once you get used to the rock of the ship. 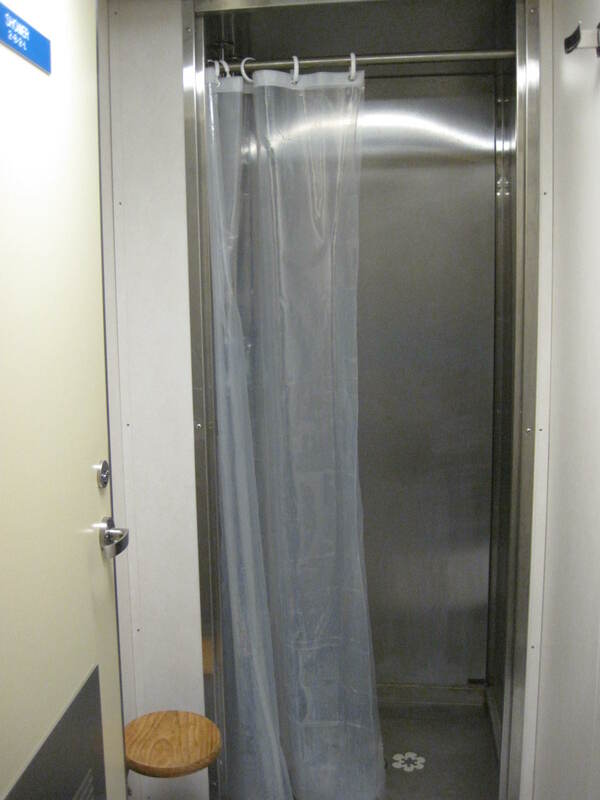 On the floor where the scientists’ berths (rooms) are, there are also two heads (bathrooms) and two showers. The ship converts ocean water into water that we can use on the ship for showering, washing hands, etc. through a process called reverse osmosis. Sea water is forced through a series of filters so small that not even the salt in the water can fit through. I was afraid that I might be taking cold showers, but there is a water heater on board, too! We are supposed to take “Navy showers”, which means you get wet, press a button on the shower head to stop the water while you scrub, then press the button to turn the water back on to rinse. I’ll admit that I find myself forgetting about this sometimes, but I’m getting much better! Today there was about an hour and a half of “steam” time while we headed to our next dredge location and had nothing official to do. Some of the people on my watch watched a movie in the galley, but I decided to head to one of the upper decks and enjoy the gorgeous views of ocean in every direction. I was awarded by a pod of about 15 common dolphins jumping out of the water next to the ship! I’m starting to get a feel for the process of science at sea and am looking forward to the new adventures that tomorrow might bring! Which way do you think is the best way to learn about the sea scallop population and ocean life in general: dredging or HabCam? Why do you think so? You can share your thoughts, questions, and comments in the comments section below. Well, it took a car, two airplanes, an airport shuttle, a bus, and a short walk, but I made it to the ship in Woods Hole, MA at about 8pm on June 26, 2012! 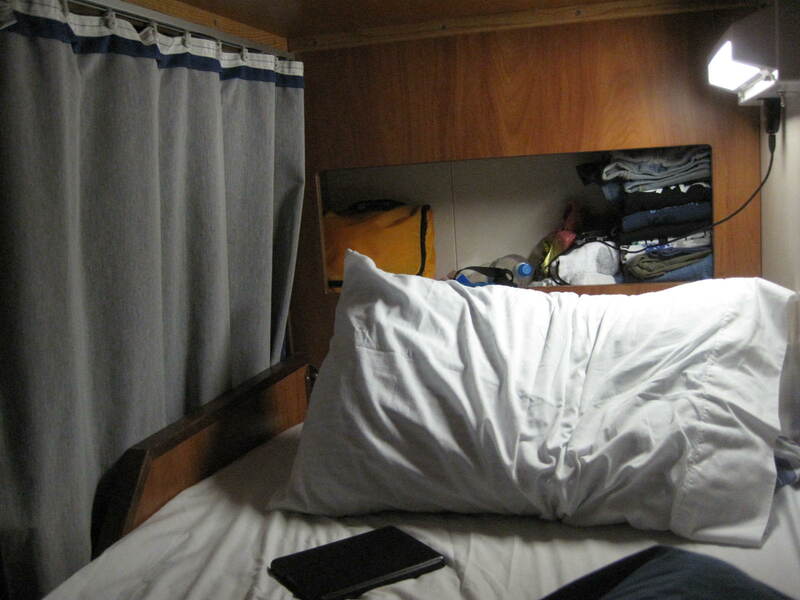 I met a few of the ship’s crew who were kind enough to show me to my room and I slept on the ship while it was in port. You can see a rather long, but informative video tour of the Hugh R. Sharp on this website and you can track the ship’s progress here. Everyone reported to the ship at 8am on June 27, but we didn’t end up leaving port until about 2pm because of last-minute adjustments to equipment, among other reasons, so the first day was pretty much the hurry up and wait game. While waiting to leave port, we did a safety drill and heard a presentation from a NOAA employee named Deborah about the basics of sea scallops. I was intrigued by all the data that she mentioned in her presentation and talked to her about it afterwards. She is a mathematician with a passion for biology who found a way to merge the two into a career. A big part of her job is to make sense of the data collected on the scallop survey and to present it in a way that can make sense to people. She uses lots of graphs and charts to help the data tell its story. She said that estimation, graphing, and numerous math skills play a huge role in her work. She was kind enough to give me her business card so that we can chat more after I return from sea, as she isn’t sailing on this leg of the survey. 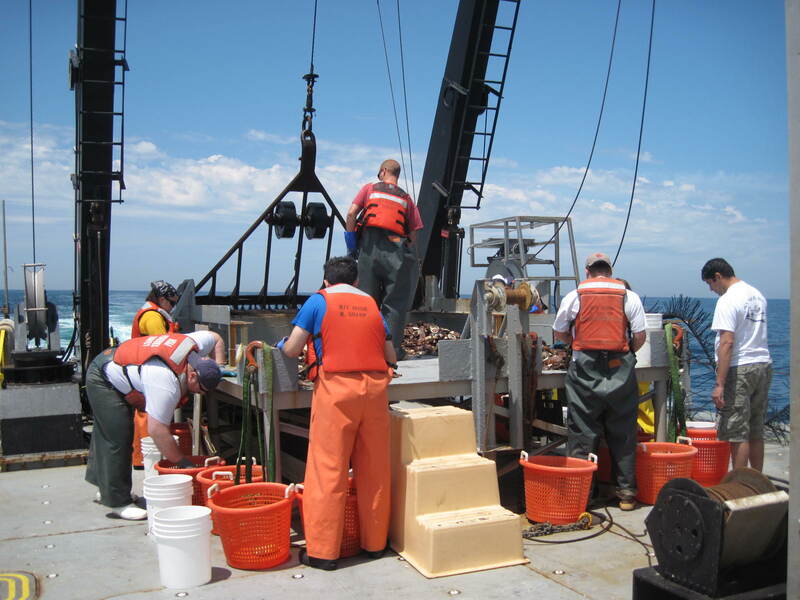 Once aboard the Hugh R. Sharp, I learned that this survey will actually be two surveys in one: about half of our time will be spent dredging, sorting, measuring, and weighing scallops. The other half of the time will be spent gathering data with a newly developed underwater camera system called HabCam. The HabCam is about a half-million dollar, 3,000-pound piece of scientific equipment that is controlled by a winch, operated inside the Dry Lab (kind of like a computer lab) of the ship by a joystick and a computer program that shows the depth of the HabCam and its height off the ocean floor. 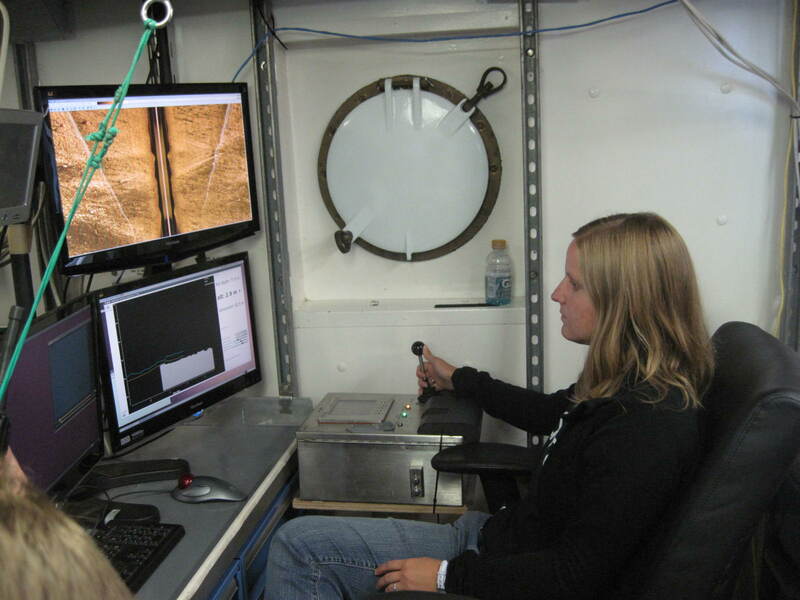 The pilot of the HabCam “flies” it approximately 2 meters above the ocean floor and the copilot keeps an eye on the images coming back from the HabCam. It takes 6 images per second, so there are LOTS of pictures to look at and the clarity is amazing. 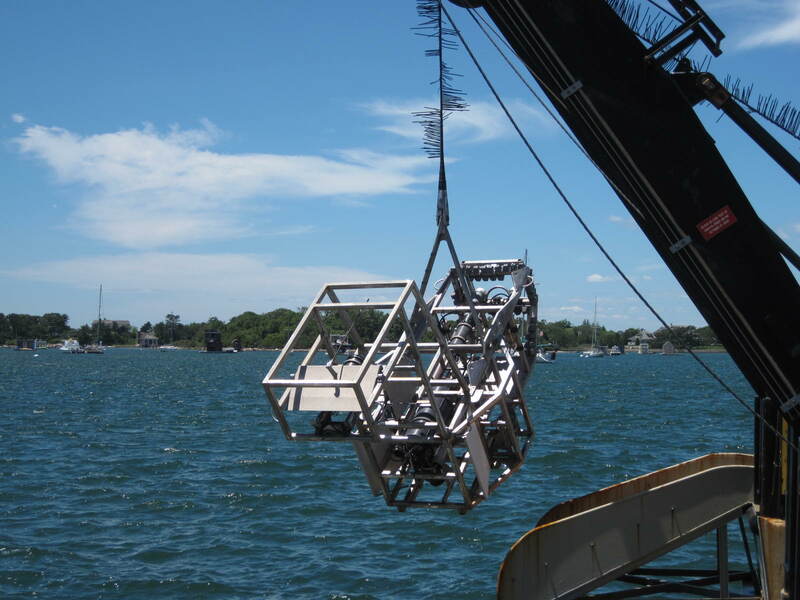 The HabCam is a pretty fascinating piece of equipment that has been under development for several years and is a cooperative effort between the sea scallop industry, NOAA (National Oceanic and Atmospheric Administration), WHOI (Woods Hole Oceanographic Institution), and others. Some of the people that developed the HabCam are on the ship with me and I have had the opportunity to talk to them about its development and uses. Each conversation always seems to have a common theme: the HabCam is a work in progress. We are using version 4 of the HabCam on this scallop survey. As they test the HabCam, they notice issues and make modifications accordingly. It is interesting to see the scientific process in action. Before we left port, they were attempting to correct an issue with pressure and vibration on the winch cable that controls the HabCam while it flies through the water. They thought that covering the portion of the cable directly above the HabCam with zip ties might help break up some of the water pressure and solve the problem. 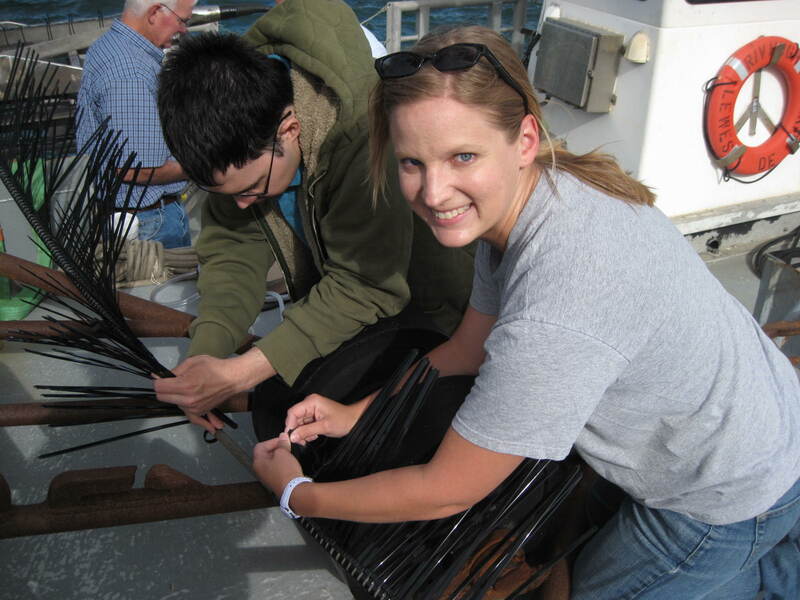 So, my first job as a scientist aboard the Hugh R Sharp involved installing lots and lots of zip ties! I had to laugh when they realized a slight glitch in the plan and had to remove many of the zip ties later. Science is a process! There are 6 people on my watch and we started with the HabCam. I had the opportunity to pilot and copilot several times. It is fascinating to see images of the seafloor that no one else had ever seen and a bit daunting to be trusted with flying such an expensive piece of equipment through the ocean! We saw skates (like a stingray), sand dollars, sea biscuits, fish, sea stars, and more. You can learn more about the HabCam by visiting this website. Life at sea is more relaxed than I expected. For some reason, I expected there to be lots of strict rules and procedures, but so far that has not been the case. This has been a welcome surprise for me, especially since despite my extensive anti-nausea arsenal, I am experiencing a rather nasty bout of seasickness. Everyone aboard has been very sympathetic and shared their personal stories of dealing with seasickness as well as remedies for seasickness that work for them (ginger ale, standing outside, etc.). I’m hoping that spending time outside today while we dredge instead of inside flying the HabCam will help. Enough about that! I share my berth (room) with four other ladies. There are two bunk beds with curtains around each bed to allow for a little privacy and to help darken the room if needed. 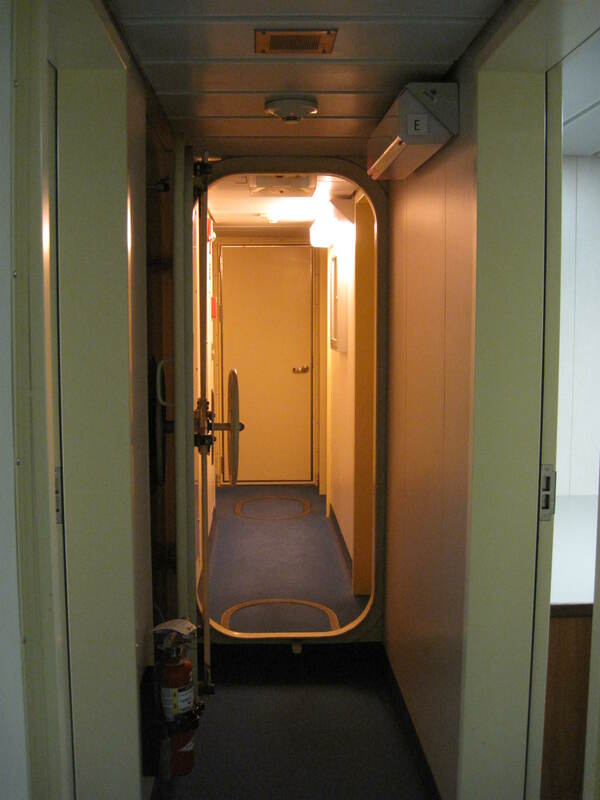 The berths are in the “belly” of the ship with no windows, so room darkening really isn’t much of an issue! I do think the curtains are sort of ingenious and wish I had them back when I was living in the dorms in college. I am glad that I packed light, since there really isn’t much of a place to store things in the berth. I’m using every inch of available space and wishing that things (like my towel) would actually dry down here, but not much luck with that so far. I managed to be the first person to get drenched on the ship on the day we left and it took three days for my clothes to dry! It’s all part of the adventure, right? Two of the people I share a room with are on the day shift (noon to midnight) and the other two are on the night shift (midnight to noon), so there really isn’t a time when all four of us are in the room at the same time. When you leave for your watch (shift), you take everything with you that you might need, so you don’t go back to the room while other people are trying to sleep. There is a constant sucking noise that sounds a bit like wind that I always hear while in my room. I initially thought it was just the sound of the ship going over the water, but now I’m wondering if it might be some type of pump. I checked with my chief scientist Geoff Shook and he told me that the sound is actually the ship’s stabilizer fins. There are 4 fins (2 on each side) that move back and forth to dampen the vessel’s roll and provide a more comfortable, stable ride. What do you think the name “HabCam” means? Does the temperature of ocean waters change depending upon its depth? 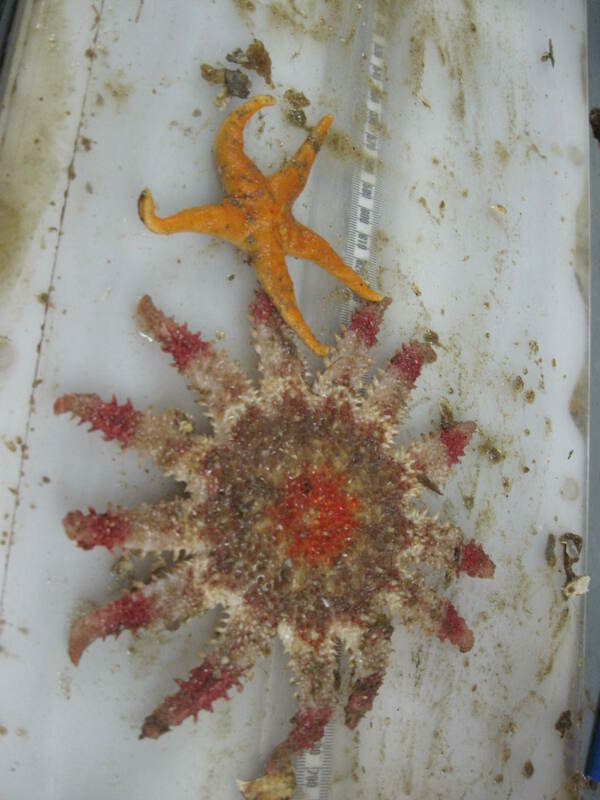 Bilateral symmetry is the drawing of a line through an object and having it be the same on both sides as a mirror image, such as sea stars and mud stars. Aside from the major science mission of the scallop survey a few other scientific investigations are taking place on the Albatross. One such project is the CTD measurements. C for conductivity, T for temperature and D for depth. I will elaborate on this in tomorrow’s journal. Another smaller project is the mapping of habitat using acoustic sounders. 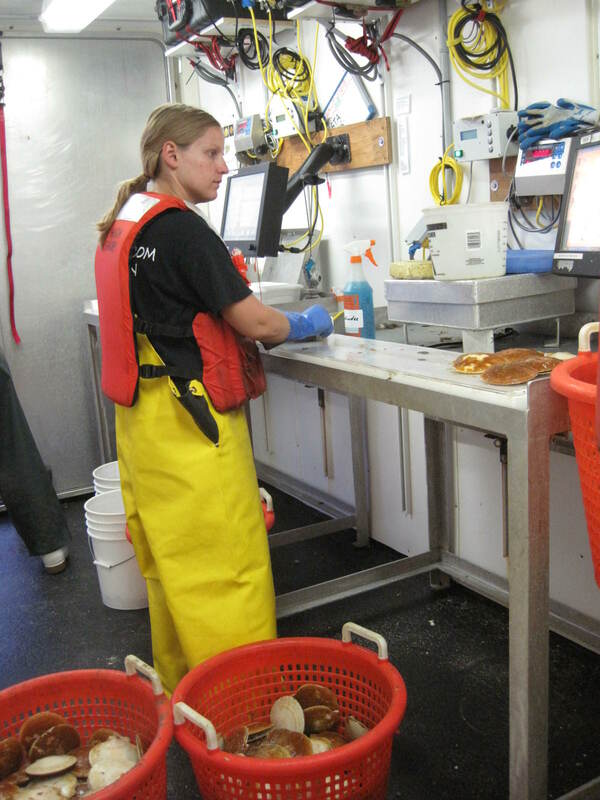 Although the scallop watch crews are labeled as scientists aboard ship, with many us with our master’s degrees in a particular science specialty, only a few are fully engaged in that role for this leg. Vic Nordahl, Chief Scientist, Dvora Hart and Avis Sosa. Vic is ultimately responsible for collecting and reporting accurate numbers of all scallops and other marine species we have documented. The watch chiefs report the data to him, but they must audit the data before a full report is made. Dvora, while on watch, depending upon the tow number will randomly check numbers of starfish, crabs and the weight of scallop meat and gonads. We are collecting numeric quantities to help better determine the age and growth of scallops in different sampling areas. 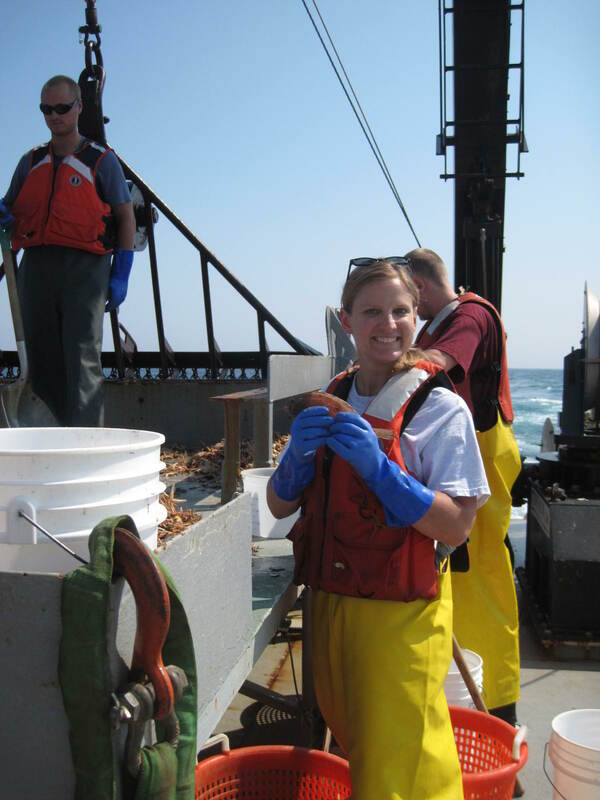 Avis Sosa moonlights on these scallop survey crews during her summer vacation from teaching. Currently she is teaching advanced placement chemistry in a large international school in Jakarta, Indonesia. She is an amazing woman with a huge supply unique life experiences from all over the world under her belt. 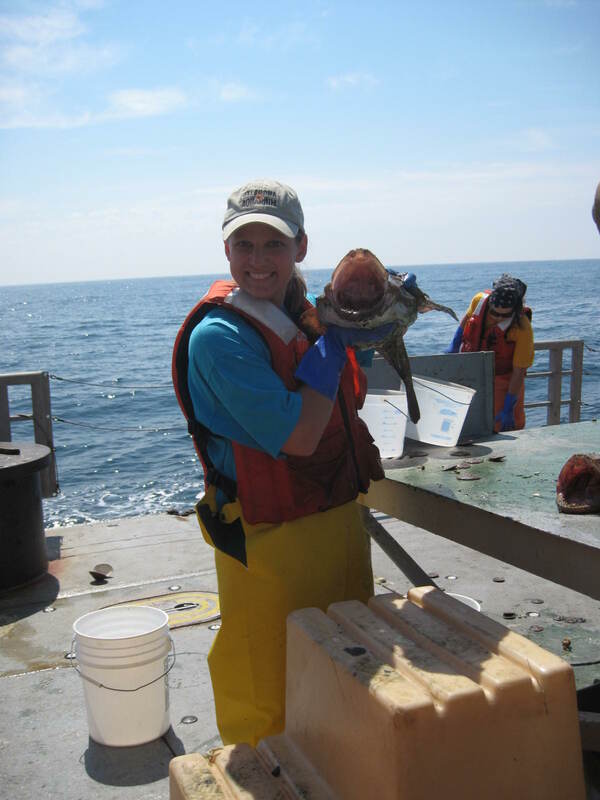 For the past 14 years, Avis has been working on various NOAA ships, first as a volunteer, now as a contract employee. 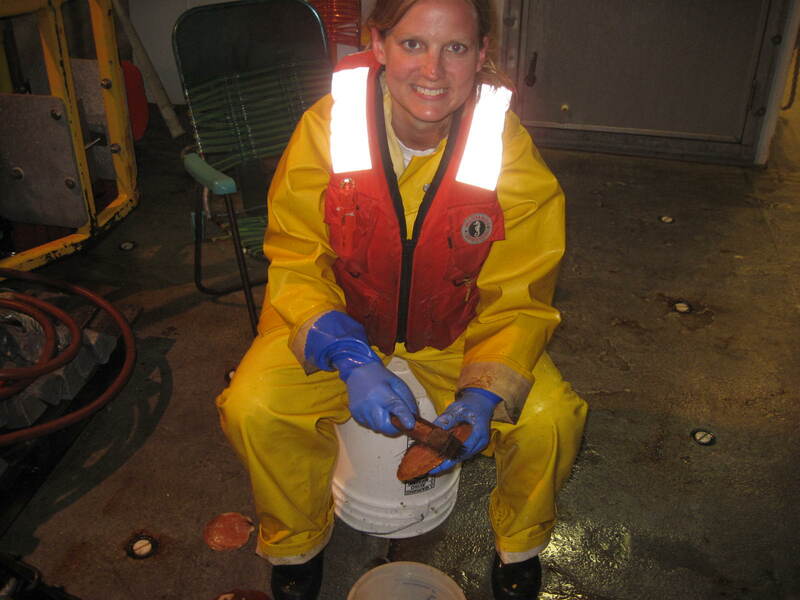 Over the years, she has become a source of expertise in her knowledge of marine mollusks. While sorting through the pile, she will identify anything in it and give you not only the common name, but the scientific name as well. Currently she is collecting specimens for the collection in the museum at the Marine Fisheries Lab. She is my role model as the quintessential independent, worldly woman! Another day of calm seas and perfect weather. 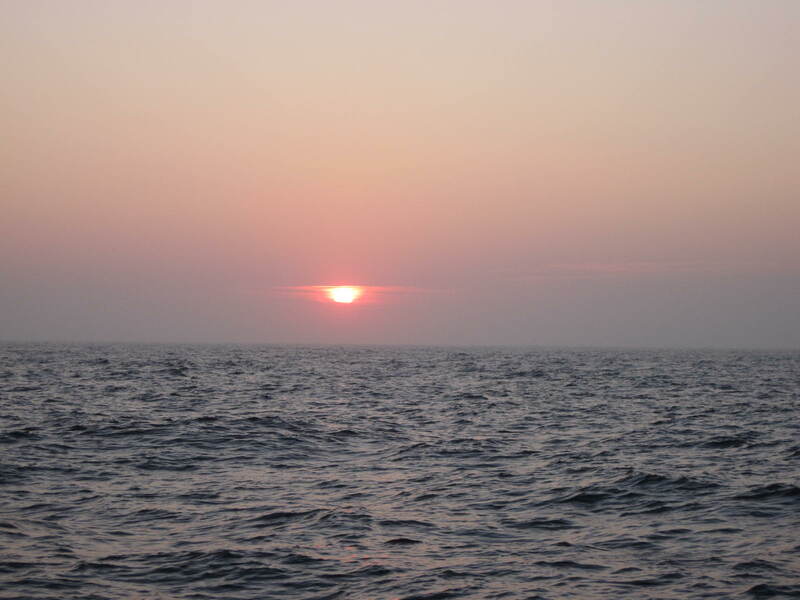 Even though I hate getting up every morning at 5 a.m., when I arrive on the fantail after breakfast, the fresh salt air and sunrises always makes the early hours worth the struggle of waking my body up. After donning my rubber boots and “Hellies”, I take a few moments to scan the horizon, note the texture of the water, lean over the deck to watch the shape of the boat wake and breathe in the air of a brand new day.